Here is what I wore with them yesterday! I am off to go try and pack for my trip, happy sunday! Love your outfit! Especially the bag and your shoes! i looooove the shoes! i've never been to the modcloth website before now. thanks for sharing! ah! I squealed a little when I saw these shoes! they look so lovely on you! and any new purchase that results in more excuses to shop is a really good thing. I am so jealous. So jealous. And your outfit is so precious, I am so jealous you get to wear headbands like that-- I have such a small giant head and such a small body. Anyway, those shoes are so perfect and that bag and the dress! 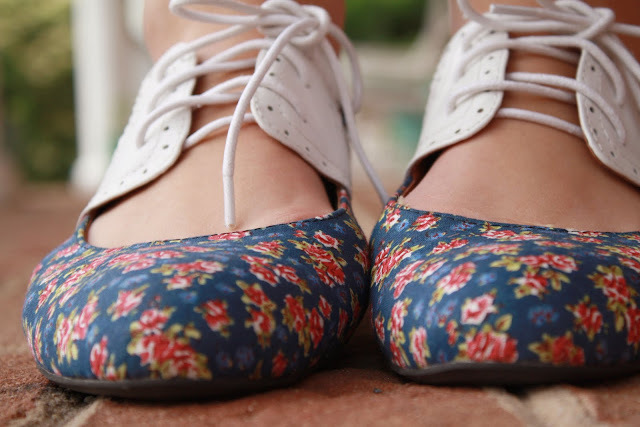 awww very cute shoes!! and I really love your dress, so romantice and gorgeous! !